Product #45991 | SKU SLR-AC50133PL | 0.0 (no ratings yet) Thanks for your rating! 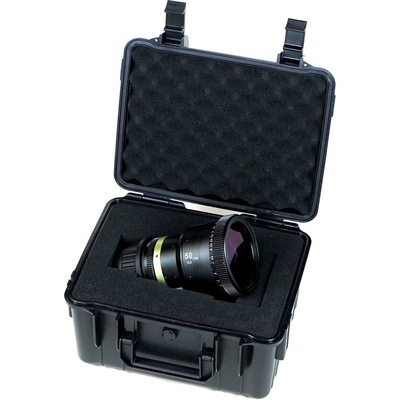 Building upon their experience with anamorphic adapters, SLR Magic produced this 50mm 1.33x Anamorphot-CINE Lens that delivers a complete, one piece, anamorphic lens with a maximum aperture of T2.8. The lens provides a 2.35:1 aspect ratio to your image when used with your 16:9 sensor. Suitable for use with cameras with a Full Frame sensor, the anamorphic lens allows you record an image with a wider aspect ratio than your sensor's native aspect ratio without cropping your image, which maximises the resolution of your image. The lens incorporates a mask that exaggerates the anamorphic lens flare effect to simulate the look of a 2x anamorphic element. The lens features a 1.1m minimum focus distance and has geared focus and iris rings. It is worth pointing out that the front of the lens rotates as you focus, which may affect your choice of matte box. The 82mm front filter thread allows you to screw in filters, such as dioptres to shorten the 1.1m minimum focus distance. This 50mm lens produces a 2.35:1 aspect ratio on 16:9 sensors. This allows you to get a greater widescreen effect while maximising your sensors resolution. The internal mask produces an anamorphic effect on flares closer to a 2x anamorphic without affecting the 1.33x optical anamorphic effect. Geared focus and iris rings allow use follow focus units or lens motors to pull your focus or iris.